One Year of EV Driving… Pure Joy… The ActiveE and me! Yesterday was “hump day”… Not really sure which day to count as I picked up the car on the evening of February 23, 2012 and I have to return it back to BMW on February 24, 2014… The Leap Year throws me off, so I guess a post on the 25th would be the best I can do to celebrate the first year of EV Driving. Either way, I’ve done a lot of driving over the past year. Surprisingly, the weekend that I celebrate one year with my car, I’m away from it and it’s soaking in the last few days of subsidized LAX parking on my quick weekend away to Napa and Sonoma. This post was going to be a little funnier than it has ended up to be as I planned on taking advantage of BMW and Sixt’s JV in the Bay Area and “cheat” on my ActiveE with a car rental. However, the timing of my arrival into San Francisco airport on Satuday morning and my lunch appointment at the French Laundry forced me to abandon those plans and opt with a traditional ICE rental (Ford Focus) from Dollar Rental Car. I will follow up with a post on my attempt to pick a car on my day back from the Wine Country. 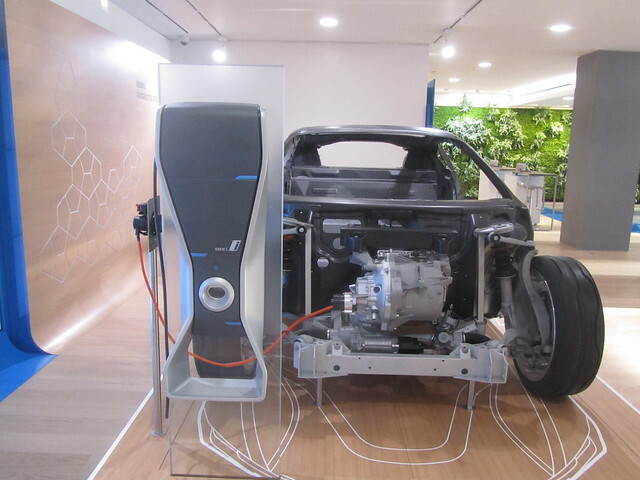 Let me start with some tips that I like to give to others as they drive EV. Top of my list as a high mileage individual is Range Anxiety and how to cope with it. 1) After each FULL charge that I complete, I reset my Miles per kWh reading and odometer so that I can have visual feedback on how I am driving and how far I have gone. Armed with the M/kWh figure I can figure out how much range I have to go in my 27 usable kWh battery pack. 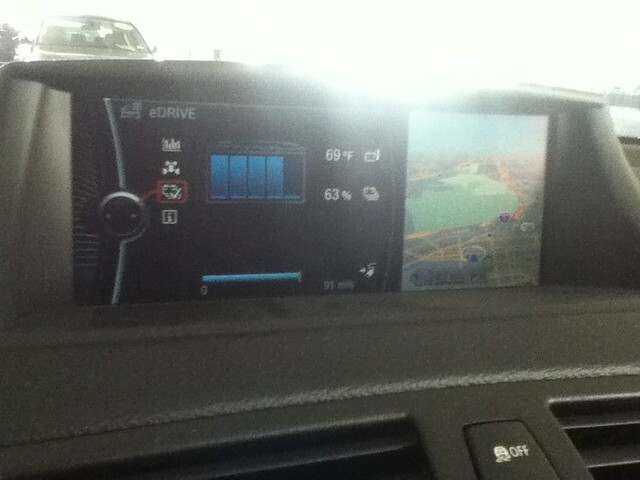 Coupled with BMW’s guesstimator I know how I need to drive and where I can drive to. So, I went from a 2.7 miles per kwh to 3.7 miles per kwh average. 2) I always have at least two devices that have the following Apps – Chargepoint, Plugshare, Recargo, and Blink. In that order. In a pinch I will pay for charging, but for the most part I try to find subsidized charging. If you can get your electrons for free, why not? I carry a BlackBerry for my primary telephone, but also have iOs devices so that I can run the apps. I use a MiFi for Internet access for those devices so it works for me. 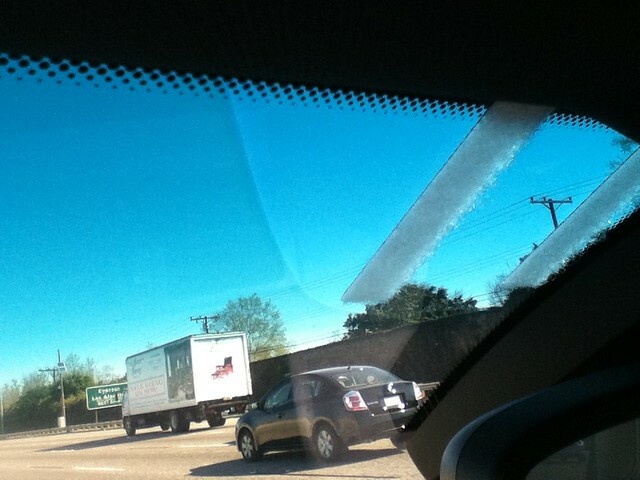 3) I almost always set the car to precondition. It’s not that big a deal in Southern California as we don’t really have the swings in temperature, but it makes me feel better. In order to ensure that I come back to a car at 100% SOC vs. 98% SOC I set the preconditioning close to the projected end of the charge time. The picture below would have a time to full charge when the car is plugged in and charging. You can then set the delayed preconditioning setting to 15-20 minutes before the end of the cycle to force the car to precondition WHILE it is still charging so that it will complete charging and preconditioning at 100%. Otherwise, if you do it from a cold battery (which is what I do on overnight charges) you may start your drive at 98%. So. Armed with information and experience, I can pretty much get around town, and often do. I have my 70 mile days and I have my 102 mile days with a few greater than 120 mile days and some parked and not going anywhere days thrown in between. Almost all EVs are fun to drive. So, if you’re not in an ActiveE, go out there and get a different one and have fun – JOIN the rEVolution!. 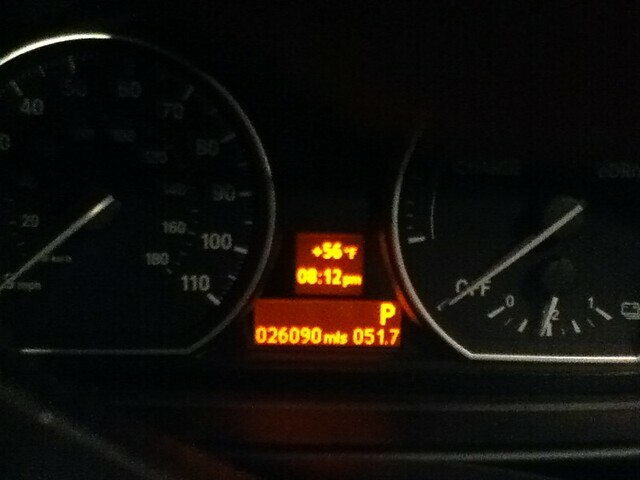 I’m just lucky enough to be in a BMW ActiveE. 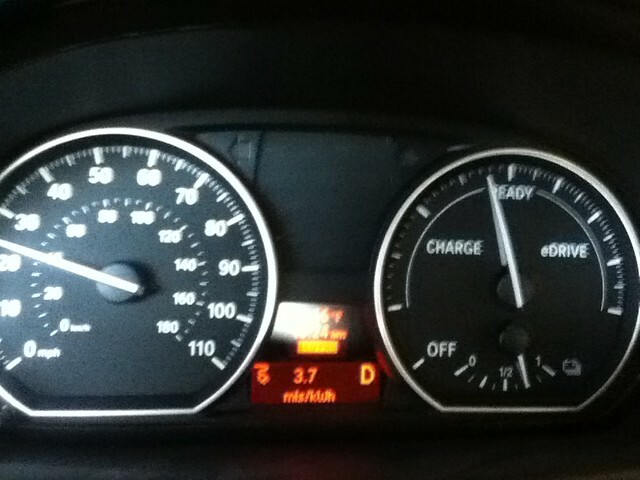 This car really drives like a BMW. 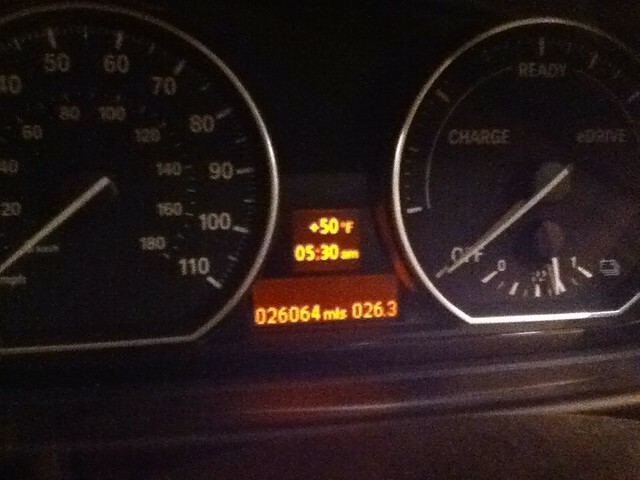 I remember the first time I drove my BMW X5. After test driving the Benz ML320 several times, it took one test drive of the X5 for my wife and I to decide that the advertisements for the “Ultimate Driving Machine” rings true. I have test driven several other EVs this past year and I have only considered the Tesla Model S to be the only other one that I would like to “own”. I would prefer to keep within the BMW family, however, BMW’s refusal to provide a longer range pure BEV as opposed to a REX enabled i3 will be the cause of my movement to a Tesla. I prefer the size of the ActiveE and i3 after it to the Tesla, however, the design is really the issue. The i3 is just too different from the styling that attracted us to BMW. It also helps that the Tesla has the larger range. A lot has been said about the ActiveE’s regenerative braking and I am a convert of this as well. Most of the other EVs have regen that is not quite as aggressive and therefore, I need to hit the brakes more than I do in my ActiveE. 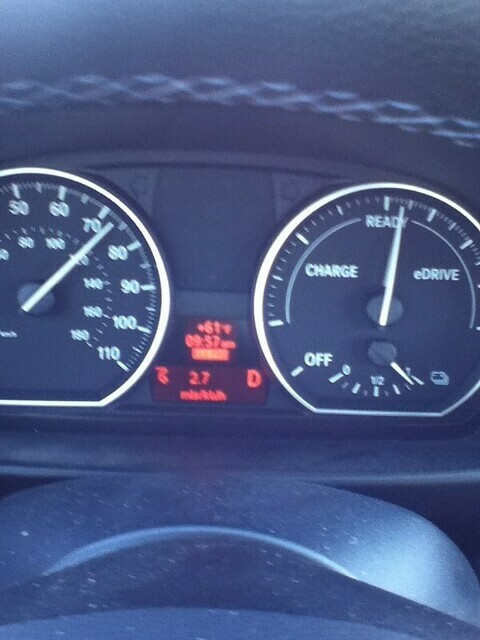 BMW “got it right” with how the ActiveE grabs hold of the brakes and lets me drive my ActiveE with a single pedal. Perhaps it has to do with BMW’s history with motorcycles. Most recently I had one of my most trusted colleagues drive the car in my stead and he commented that the single paddle experience was similar to how some motorcycles performed. (he rides a BMW motorcycle). What can BMW do to keep me as a future BMW EV driver. 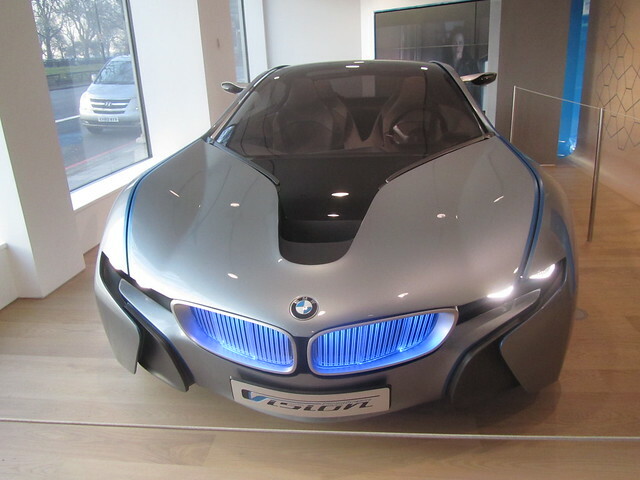 Build EVs that look like a BMW! The aesthetic is IMPORTANT. Others have commented on how much they like the i3… I’m not one of them. I like the i8 (all of them), but I’m not spending that kind of money on any car. The reported prices are the price of a Model S and Model X combined. And that sort of commitment will drive me toward Tesla. Even after one year of EV driving under the belt, the experience still surprises me. I’ve done 5 scheduled maintenance trips and 2 unscheduled ones to the dealership. 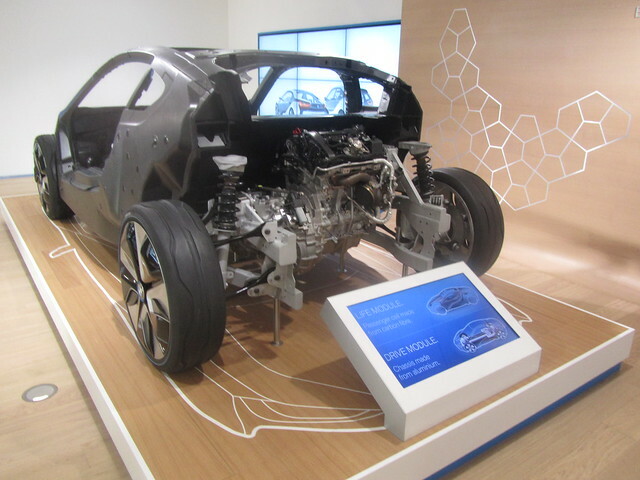 The most famous one was my first Drivetrain Malfunction from less than one week into the experience that was documented in the BMW ActiveE Forums. 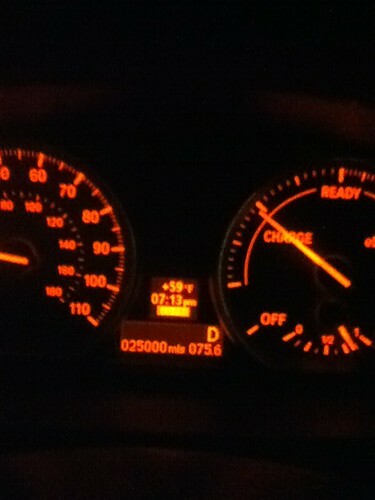 My last service experience was a little over 250 miles ago at 25,750 and the car was in the shop for about a day. This is effectively the same experience I’ve had with my X5 and 3 series vehicles. As this process becomes more common, I expect to have the opportunity to drive my ActiveE more in the following year and hope to drive greater than the 26,090 that I did in my first year. But we’ll have to see. 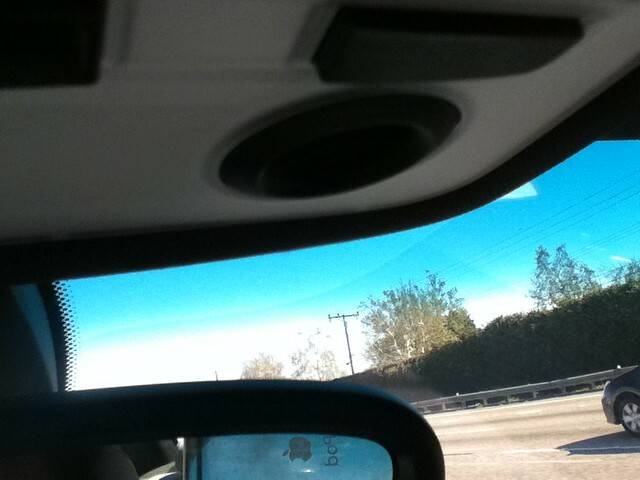 Do you see the change in tint on the picture below? The newer BMWs have a coating that keeps out IR and this could inhibit the Toll Collection transponders from responding properly. 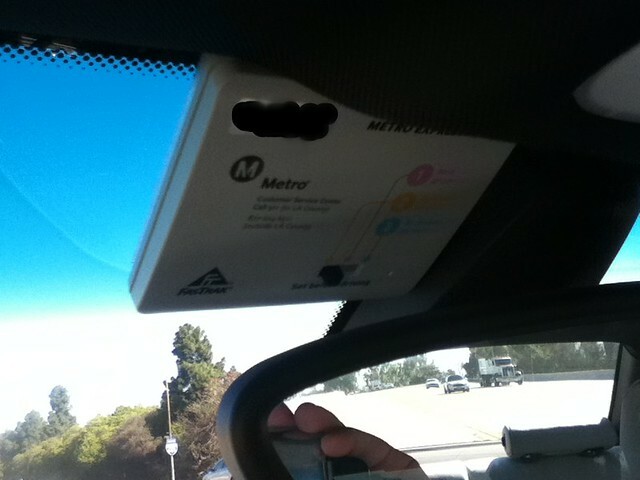 In Southern California, there are these newer switchable transponders that one must use to self-report the number of passengers in the vehicle and the agency is unable to get an accurate count if the transponder is not in the clear glass section. What this means is that you either do not get the “discounted” or free rate to travel the toll roads with more people in the car. So, those that are travelling on I-110 or I-10 Tollways in a newer BMW, take note if you keep getting charged for solo travel if you have multiple passengers in the vehicle. The passion that folks have for their EVs is warranted. The numerous stories of the recent NYT vs. Tesla spat and the Tesla Owners who got together to recreate that drive is a several day long commitment to show the world that EVs are hopefully here to stay. Over the past year I have gone from getting the ActiveE to be able to drive the HOV lanes by myself to a vocal proponent of EVs in general. I don’t care about the environment, in the traditional sense. I care about saving money in the long run. Yes, it may seem that some of these things are costlier in the short run, but I expect to be around for a long time and I expect my next vehicle to be around for a long time as well. Too bad I have one year left on my ActiveE. But sure am glad in the journey that it and I have taken together. 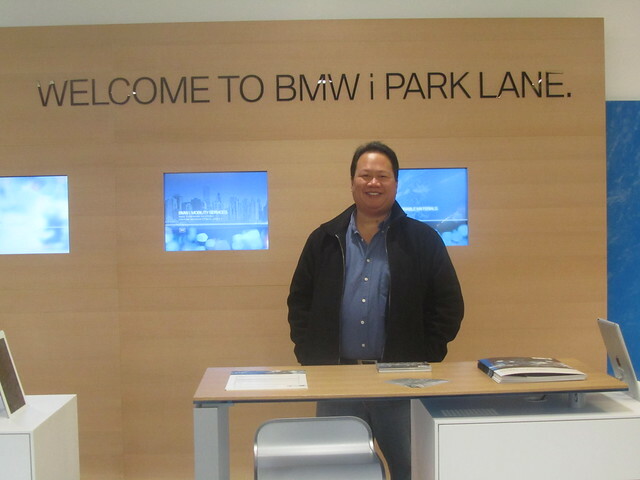 Posted on February 25, 2013 Categories ActiveETags ActiveE, BMW, BMW ActiveE, Lessons Learned, One Year1 Comment on One Year of EV Driving… Pure Joy… The ActiveE and me! 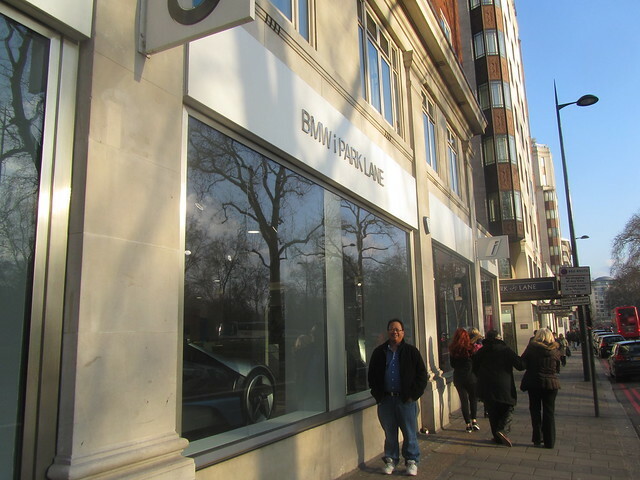 In London for a quick trip and decided to stop by the BMWi Store in Mayfair. Mayfair is a pretty glitzy part of London and the first location identified by BMW to present it’s BMWi sub-brand with a permanent and prominent location. Amidst walking by the Aston Martin dealership and others in the area, I have to admit that the strategy may just be the right one. This location was originally set up prior to the BMWi World Tour that we visited in New York City and currently features older versions of the i3 and i8 Concept. What makes this location different than the World tour is the space is much smaller and the vehicles themselves are older versions of the i3 and i8. The i8 at this location was the one featured in the film Mission Impossible: Ghost Protocol (AKA Mission Impossible 4) and was the first of the i series that I’ve ever seen in any media. 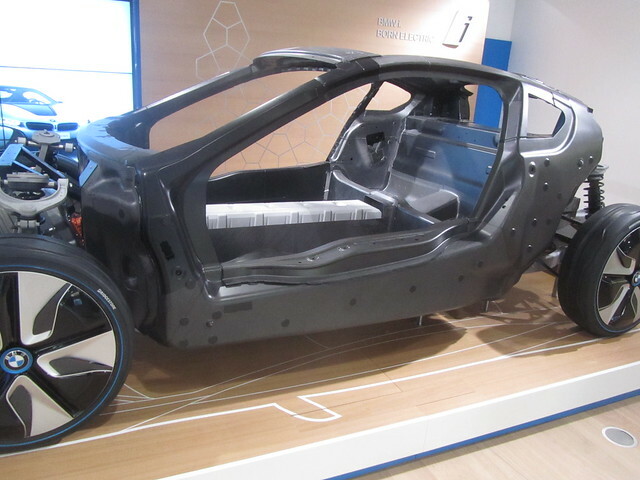 The young lady, Jess, who hosted our visit to the BMWi store explained that the biggest challenge that they have at the location was having to explain to interested parties that they would have to wait to take delivery of the i8. Some of the more affluent have tried to resort to offering more than BMW is asking for the car to get it delivered NOW. Alas, this writer does love the look of any of the BMW i8s, but will have to resort to considering the i3 or i3 Coupe if I were to stick with the BMW line. With the location in Mayfair, I would think that BMW would be moving more of the i8s than the i3s… But, I guess time will tell. Next time, I’ll have to try to get to BMW Headquarters and see the exhibit of 40 years of BMW Electrics that they tweet/G+ post from time to time. Oh, and we’re ONE WEEK from my ONE YEAR Anniversary and the Active E is going in for “regular” service on Tuesday. Here’s to wishing for a quick turnaround! ActiveE, a photo by dennis_p on Flickr. Reached 25,000 Miles a few days ago… Seeing that my one year anniversary will be in a few weeks I figure to write more about my experience then.In the meantime. 25,000 miles all electric. Using a blended 1.5 cents per mile figure (just estimating here since it’s closer to 0.8 cents per mile since I’ve gotten solar at home) nets me a $375.00 energy cost for the 25,000 miles. Comparing this with an estimated 15 cents per mile for gasoline (rounding down ’cause it’s easier to do the math…) puts the estimated mileage cost to $3,750. So looks like we’ve at least saved $3,375 this past year on the miles that we used electricity vs. gasoline.